Installing AutoTweetNG or Joocial is no different than installing any other Joomla!™ extension on your site. You can read the complete instructions for installing Joomla!™ extensions on the official help page . Throughout this chapter, we assume that you are familiar with these instructions and we will try not to duplicate them. Please note that installing and updating AutoTweet (and almost all Joomla! extensions) is actually the same thing. If you want to update AutoTweet please remember that you MUST NOT uninstall it before installing the new version! When you uninstall AutoTweet you will lose all your settings. This is definitely something you do not want to happen! Instead, simply install the new version on top of the old one. Joomla! will figure out that you are doing an update and will treat it as such, automatically. If you find that after installing or updating AutoTweet, some features are missing or doesn't work, please try installing the same version a second time, without uninstalling the component. The reason is that very few times the Joomla! extensions installer infrastructure gets confused and fails to copy some files or entire folders. By repeating the installation, you force it to copy the missing files and folders, solving the problem. Over 60+ extensions are integrated (please, check the list of integrated extensions here , or review the System Check menu in the extension). After you install the main component, only the core plug-ins are installed for content integration. For instance, Joomla Content plug-in for articles. Optional Plug-ins must be manually installed and enabled. You can find them in the downloaded package, inside the plugins/ directory. You only have to install the optional plug-in associated with your required extension. If you have manually installed an Optional Plug-in, please remember to update it manually when a new version is available. If you plan to uninstall an integrated extension, first uninstall the integrated optional plug-in. The easiest way to install AutoTweet is using the Install from URL feature in Joomla!. This Joomla! feature requires that your server supports fopen() URL wrappers (allow_url_fopen is set to 1 in your server's php.ini file) or has the PHP cURL extension enabled. Moreover, if your server has a firewall, it has to allow TCP connections on ports 80 and 443 to www.extly.com and cdn.extly.com. If you don't see any updates or if they fail to download, please ask your host to check that these conditions are met. If they are met but you still do not see the updates, please file a bug report in the official Joomla! forum . In the meantime, you can use the manual update methods discussed further below this page. First, go to our site's download page for AutoTweet. Make sure you are logged in. If not, login now. These instructions won't work if you are not logged in! Click on the version you want to install. Please note that the latest released version is always listed first on the page. On that page, you will find AutoTweetNg Free, Pro and Joocial. Next to the Download Now button you will see the DirectLink link. Right-click on it and select Copy link address or whatever your browser calls this. Now go to your site's administrator page and click on Extensions, Extension Manager. If you have Joomla! 3.x click on the Install from URL tab. Clear the contents of the Install URL field and paste the URL you copied from our site's download page. Then click on the Install button. Joomla! will download and install the AutoTweet update. You can download the latest installation packages from our site's download page for AutoTweet. Please note that the latest version is always on top. Click on the version you want to download and install. We provide two installation packages: com_autotweet_v....zip or UNZIPME-autotweetng-.....zip. The first file provides the core component, and the second file has the core component and all the optional plugins. If you download the whole distribution, please remember to unzip it to install the core component. Click on the AutoTweet item to download the ZIP installation package. All AutoTweet installation packages contain the component and all of its associated extensions. Installing it will install all of these items automatically. It can also be used to upgrade AutoTweet; just install it without uninstalling the previous release. Log in to your site's administrator section. Click on Extensions, Manage link on the top menu. If you are on Joomla! 3.x, please click on the Upload Package File tab. Locate the Browse button next to the Package File (Joomla! 2.5, 3.0 and 3.1) or Extension package file (Joomla! 3.2 and later) field. Locate the installation ZIP file you had previously downloaded and selected it. Back to the page, click on the Upload & Install button. After a short while, Joomla!™ will tell you that the component has been installed. You can download the latest installation packages our site's download page for AutoTweet. Please note that the latest version is always on top. Click on the version you want to download and install. Before doing anything else, you have to extract the installation ZIP file in a subdirectory named autotweet on your local PC. Then, upload the entire subdirectory inside your site's temporary directory. At this point, there should be a subdirectory named autotweet inside your site's temporary directory which contains all of the ZIP package's files. Assuming that you are past this uploading step, click on Extensions, Manage link on the top menu. If you are on Joomla! 3.x please click on the Install from Directory tab. Locate the Install Directory edit box. It is already filled in with the absolute path to your temporary directory, for example /var/www/joomla/tmp. Please append /autotweet to it. In our example, it should look something like /var/www/joomla/tmp/autotweet. Then, click on the Install button. If you still can't install AutoTweet and you are receiving messages regarding unwritable directories, inability to move files or other similar file system related error messages, please consult our installation troubleshooting instructions. If these instructions do not help please do not request support from us; we are unlikely to be able to help you. These errors come from your site set up and can best be resolved by asking your host for assistance or by asking other users in the official Joomla!™ forums. Upgrading from AutoTweetNG, either Free or Pro, to AutoTweetNG Pro or Joocial is by no means different than installing the component. You do not have to uninstall the previous version; in fact, you MUST NOT do that. Simply follow the installation instructions to install AutoTweetNG Pro or Joocial over the existing AutoTweet installation. That's all! All your settings are preserved. Our extensions can be upgraded just installing the new version on top of the previous version. However, we recommend to test the update on a development site, check the new features and test the right configuration for you before the deployment. If you are upgrading from an old version ... when you skipped several versions ... we "strongly" suggest testing the new version before the upgrade. You can easily check for the latest published version by visiting site's download page for AutoTweet. The page lists the version and release date of the latest AutoTweet release. You can also check it against the data which appear in the right-hand pane of your AutoTweet Control Panel. If your release is out of date, simply click on the Download link to download the install package of the latest release to your PC. AutoTweet solution has a component, modules, core plugins, and optional plugins. AutoTweet component, modules, and core plugins are updated by Joomla! Extensions installer. But, AutoTweet optional plugins, which are manually installed, must be also manually updated following the same procedure. This Joomla! feature requires that your server supports fopen() URL wrappers (allow_url_fopen is set to 1 in your server's php.ini file) or has the PHP cURL extension enabled. Moreover, if your server has a firewall, it has to allow TCP connections on ports 80 and 443 to www.extly.com and cdn.extly.com. If you don't see any updates or if they fail to download please ask your host to check that these conditions are met. If they are met but you still do not see the updates please file a bug report in the official Joomla! forum . In the meantime, you can use the manual update methods discussed further below this page. From the icon your Joomla! administrator control panel page. On Joomla! 3 you will find the icon in the left-hand sidebar, under the Maintenance header. It has an icon which looks like an empty star. On Joomla! 2.5 you will find it in the main area of the control panel page, under Quick Icons. When there are updates found for any of your extensions you will see the Updates are available message. Clicking on it will get you to the Update page of Joomla! Extensions Manager. From the top menu of your Joomla! administrator click on Extensions, Extensions Manager. From that page click on the Update tab found in the left-hand sidebar on Joomla! 3 and the top navigation bar in Joomla! 2.5. Clicking on it will get you to the Update page of Joomla! Extensions Manager. If you do not see the updates try clicking on the Find Updates button in the toolbar. If you do not see the updates still you may want to wait up to 24 hours before retrying. This has to do with the way the update CDN works and how Joomla! caches the update information. Unfortunately, we can't do anything about it, especially in Joomla! 3 (there is no way to clean the updates cache forcibly). If there is an update available for AutoTweet tick the box to the left of its row and then click on the Update button in the toolbar. Joomla! will now download and install the update. AutoTweet needs you to set up the Download ID before you can install the updates and enable all available features. You can find your main Download ID , in your Account/Your Download ID . Then go to your site's administrator page and click on Components, AutoTweet, and click on the Options button in the toolbar. Click on the Live Update tab and paste your Download ID there. Finally, click on Save & Close. As noted in the installation section, installing and updating AutoTweet is the same thing. 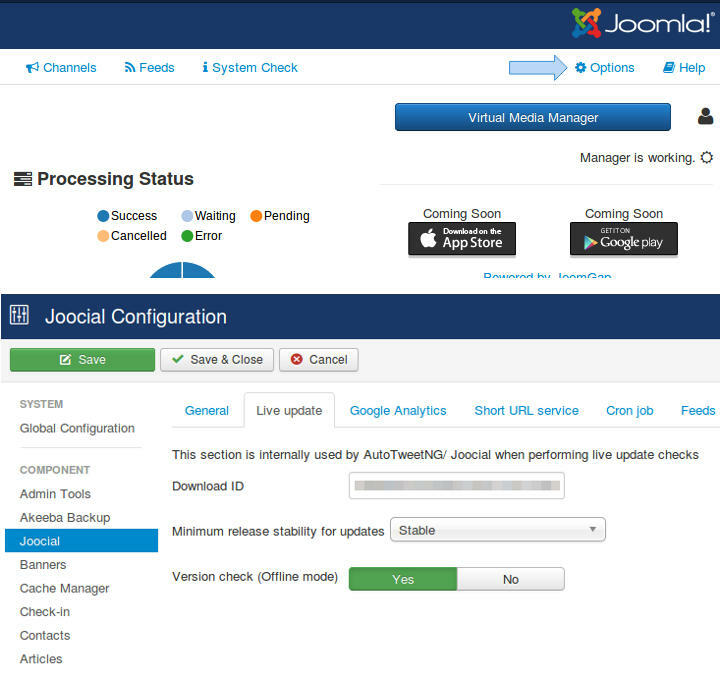 If the automatic update using Joomla! 's extensions update feature does not work, please install the update manually following the instructions in the installation section of this documentation. When installing an update manually you MUST NOT uninstall your existing version of AutoTweet. Uninstalling AutoTweet will always remove all your settings. You definitely not want that to happen! You can uninstall the component just like any other Joomla! component. In your site's back-end, just go to Extensions Manager, click on Uninstall, select AutoTweet and click on Uninstall. This will completely remove AutoTweet including all plugins, modules and ticket information.